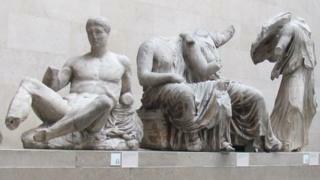 Image caption The British Museum says it can display the sculptures "in the context of world history"
"The Olympics are a four-yearly reminder to the world of all we owe to Greece," said former MP Eddie O'Hara - who chairs the British Committee for the Reunification of the Parthenon Marbles. The meeting, he added, "ought to remind people in London and throughout the world that there's one debt to Greece that will never be repaid until those sculptures in the British Museum are returned." But he said there was a "hiatus" in the campaign because economic woes meant not much action could be expected from the Greek authorities. "There is no excuse," said Emanuel Comino, head of the Australian committee for the Restitution of the Marbles, for the British and Greek governments not getting together to discuss demands for the sculptures held in London to be reunited with those still in Athens. And the museum says its Parthenon sculptures, displayed in the same building as relics of so many other civilisations, are "an important representation of ancient Athenian civilisation in the context of world history." "I want to see the Marbles of the Parthenon reunited, not because of some legal argument but because culturally and ethically it's the right thing to do," said Mr O'Hara. But Michael Reppas, who chairs the American Committee for the Reunification of the Marbles, said litigation should not be ruled out. "I absolutely don't believe it's a foregone conclusion that the issue will be unsuccessful for the Greeks." The prospect of a court battle raises the pace and "stirs people and makes people act," he said. Most thought a claim would have to be pursued in England - but other venues were possible, Mr Reppas told BBC News, such as Athens or the United States. Some thought Greece could not be expected to enter such a battle - but Mr Reppas thought it could be "a great morale booster for the Greek people right now". Former MP Andrew Dismore said a challenge now to the British Museum's right to have acquired the marbles in 1816 faced insurmountable obstacles. A court battle would be an "expensive and time-consuming sideshow", and losing it would do major damage to the campaign to send the Marbles back, Mr Dismore told the meeting. Greek-South African human rights advocate - and lawyer to Nelson Mandela - George Bizos said "we should try to increase the number of our friends" in parliament, the universities and schools, and the media, until the British said "Let's come to terms". "But the threat of litigation cannot be set aside altogether," he said. If there were a court case the Greeks might lose, he said, but the evidence would prove the House of Commons was "taken for a ride" when it decided in the 19th century that British envoy Lord Elgin was the legitimate owner of the Marbles which he had removed from the Acropolis and shipped to the UK. The letters indicate that "There was no legality whatsoever in Elgin's acquisition of the Marbles and he knew it well," she said.